If you look back at the Evolution of Blockchain, you will find that the technology only came into the limelight because of its association with the groundbreaking element that Bitcoin is. Bitcoin and Blockchain were the two terms that were used synonymously by a number of people around the world till even some years back. But in the past some years, as the world got clearer with what the technology is about, the space between Blockchain Cryptocurrency has extended. And today, the non-cryptocurrency Blockchain has not just established itself as a technology that Bitcoin is just a subset of, it has also marked itself as the solution of the two problems that all businesses, across industries, unanimously face – Security and Lack of Transparency. 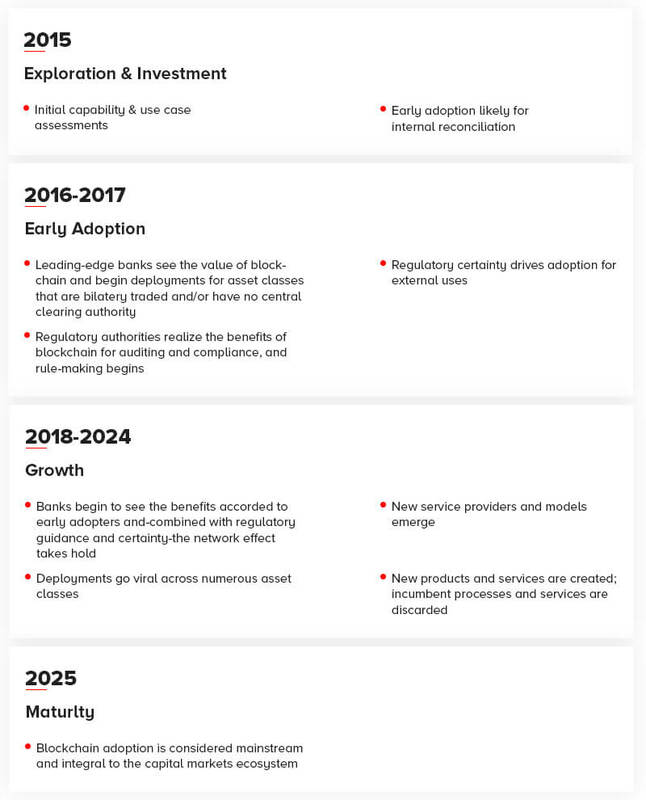 Let us briefly look back at how far the Blockchain technology has come and the route it has charted for itself. As you can see in the Blockchain Technology Timeline above, the tangent on which Blockchain is walking is an answer in itself to all the naysayers who doubted its worth and called it a hype that would soon die. The direction in which Blockchain is headed in and the direction it started from is a sign of how far and fast the benefits of the disruptive technology have been accepted and added in a number of processes across a range of different industries, something that we have detailed in our handbook curated especially for businesspersons, called Entrepreneur’s Guide to Blockchain. 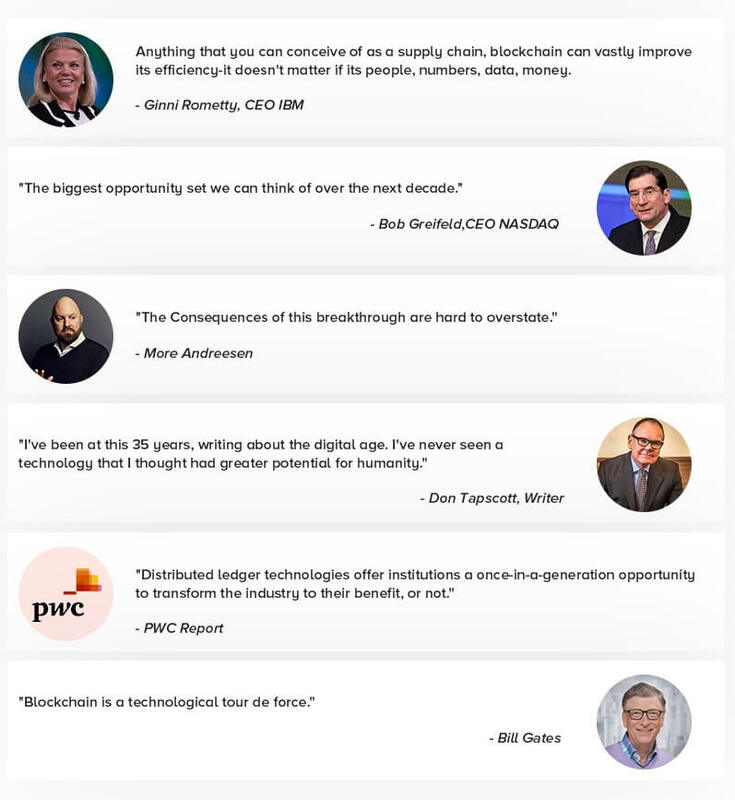 Benefits that come attached with Blockchain have not gone unseen by the industry leaders. The discussions that were earlier focused on Bitcoins and Cryptocurrencies have now been fixated on to the Blockchain technology. Blockchain technology, along with its benefitting features is now playing the main character of successful industries growth stories – an event that is triggering the demand for Blockchain App Development Agency that would help businesses achieve greatness and profitability with the disruptive technology. 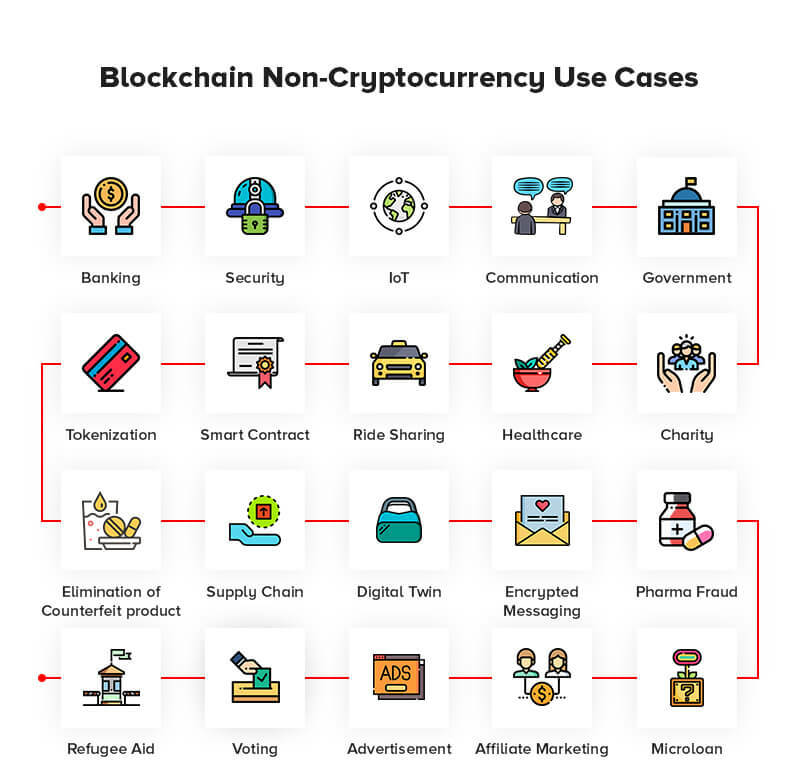 Here are the Blockchain use cases that show how the technology, even in the absence of cryptocurrency, holds the potential to change the world. Fraud Reduction – By bringing all the information on a distributed ledger with a timestamp and batches of specific transactions with a link to another block, the technology will make it impossible for the hackers to breaks into the system without the timestamp of the breach getting highlighted. KYC – It is estimated that banks spend somewhere around $60 million up to $500 million per year in their ‘Know Your Customer’ project. These practices are followed to lower the money laundering instances and to keep terrorist out of the banking ecosystem. If the KYC process is brought on Blockchain, the verification time and associated cost will get lowered by manifold. When it comes to cloud and the typical computer network usage in business, centralized servers are usually used to store the data. Now, when you save all your business data on a centralized system, you open yourself to risks like corruption, data loss, human error, and hacking. But when you put your data on a distributed, decentralized Blockchain system on Cloud, the instance of hacks reduces by manifold. The mesh of connected devices while connects all the phases of a user’s life with each other, also brings it on a vulnerable position. When you operate in a connected ecosystem, the moment your one device gets hacked the chances of your connected devices to get attacked also increases by manifold. But when you introduce Blockchain in the picture, the IoT sensors get to exchange data on the platform instead of a third party. Also, since the devices are addressable with Blockchain, businesses get access to the usage history of the connected devices, which comes in handy at the time of troubleshooting. Blockchain enables safer, faster, and a lot more reliable set of automated communications. While automated conversations are already a big part of a number of industries, the communication happening in an automated mode is mostly asynchronous – something that Blockchain can change. With Blockchain, companies would be able to have more bi-directional and authorized communications. Also, as the world is now moving towards chatbots, Blockchain would be the business solution for the time when bots interact with each other and the problem of transparency and time stamping comes up. The blockchain is a hot-topic in the government and political backdrop. The technology has a number of applications that improve the government service quality, safeguards the citizen’s property rights, and cuts the red tape, all the while improving the transparency element in the system. While governments all across the world – from Dubai to China and the US are exploring the Blockchain opportunity to better the nation’s lifestyle, the trend of adoption is mostly restricted to Ethereum. Dubai is prepared to become a completely integrated Blockchain based city by 2020. Estonia matured in a ‘digital republic’ ecosystem by shifting a number of its national system on Ethereum Blockchain. Chile makes use of Ethereum to track down the finance and data from the energy grid with the aim to curb exploitation and corruption by making the data available for the citizens to see. Canada is testing the platform for providing transparency to how the government use grants for easing the concerns that citizen’s show related to corruption and misappropriation. The number one reason that usually keeps people away from making a donation is not knowing whether or not the donations that they are making are even being used for the right reasons. When Blockchain solutions are introduced to the system, the technology help ensure that the money is being used exactly where it was supposed to. In order to bring in some transparency in the system, a number of Bitcoin-based charities are coming into existence that ensures that allows the donors to view how their money is being used. The inclusion of Blockchain technology in Healthcare is the live example of how disruptive an industry could be when clubbed with revolutionary technology. And this is the reason why Blockchain has found a place in the 9 healthcare trends that would be dominant in 2018. The fact that Blockchain comes with an immutable architecture makes it possible to store the EHR data in a way that is safeguarded from any or all instances of hacks and breaches. Also, when incorporating at the center of medical research, technology can even help with the creation of new medicine or a more personalized treatment regime. Mixed with the ride-sharing architecture, Blockchain has the potential to make the industry pioneers like Uber make a run for their money. When you look at the Uber ecosystem you will find issues like the brand making a cut from driver’s income or it calling the shots on all the terms and conditions that are majorly partial towards the brand’s profits. By introducing Blockchain in the ride-sharing economy like what Arcade City does, the control comes in the hand of riders and drivers. They get to make all the decisions without looking up to a ruling agency. By identifying the production processes and components and then storing the information on Blockchain, a business can monitor their supply chain process from the raw material stage to the end delivery stage. For example, Walmart uses Blockchain to enable its employees to scan the goods in the store’s app and then track them from the harvesting stage to the time it reaches the store floor. On the other hand, Makers use technology to monitor the cargo ships. Blockchain takes the end-to-end encryption to a new level by introducing decentralization to the mix. Brands like Crypviser are doing the task of creation of a Blockchain based communication platform perfectly. Through a platform of this sort, businesses get to offer their users a place where they can make the to and fro of encrypted messages that have minimal to zero scopes of getting hacked. A platform like blockchain-based encrypted messaging solutions is especially helpful when incorporated within an Enterprise system. The fact that Blockchain technology is immutable, it becomes a lot easier for the businesses to find out and trace the chain of asset ownership. By storing the serial number on a Blockchain, all the involved parties are able to verify whether or not the product in question authentic. De Beers, the world’s biggest diamond producer, has created an immutable digital record using Blockchain which they use to keep the record of registered diamond and lower the conflict diamond transactions. The self-executing programs are one of the best offerings of Blockchain to the business world. Smart contracts Blockchain is designed in a way that they check the contract rule, verify, and process the transaction all without the need for an intermediary involvement. Smart Contracts Blockchain are used in a number of different scenarios and across a number of different industries that deal with the creation of contracts in their processes. World Health Organization has estimated that 1 out of 10 medical products that are circulating in the in the low or medium income countries are not just sub-standardized but also falsified. To lower the instances of pharma fraud, Verifier – a smartphone app uses the phone’s camera to conduct a spectral analysis on the drug and loads it on Blockchain for verification of the drug’s medical footprint. Twigga is an example of how Microloans work with Blockchain technology. The B2B Logistics platform for food stalls in Africa had expanded its services into adding financial services in the suite for their customers, with the help of Blockchain. While they use AI to find out the credit score on the basis of mobile data, they incorporated Blockchain to manage the complete lending process from the application of loan to getting offers and accepting the conditions of repayment. Delivering timely and the relevant ad is every advertiser’s aim. 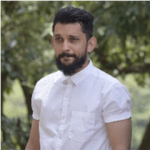 And the answer to how Blockchain will change the world of advertisers lies in using the technology to navigate the tracks of the different service providers and linking them all together – an event that ensures right people are targeted at the right time. Also, it saves the advertisers from losing money when the hackers create fake web traffic and make fake bots visit the site in place of real humans by tracking the origin of the visitors and gauging if they are authentic. The concept of Affiliate Marketing lies in businesses paying a set of the commission to the people who would promote their product on the social media platforms. The concept in itself is based entirely on trust. Trust that the people won’t remove the post after getting a commission or that they won’t use fake ids for promoting a website etc. Smart contracts Blockchain functionality ensures that the money is transferred to the people only when they have done ABC task. Seeing these Blockchain use cases and how perfectly the technology is able to decentralize the various economies, a number of the world’s biggest brands, with the support of the Top Blockchain App Development Companies, have now started exploring the technology with the hopes to turn their business growth story alongside the growth in Blockchain future uses. 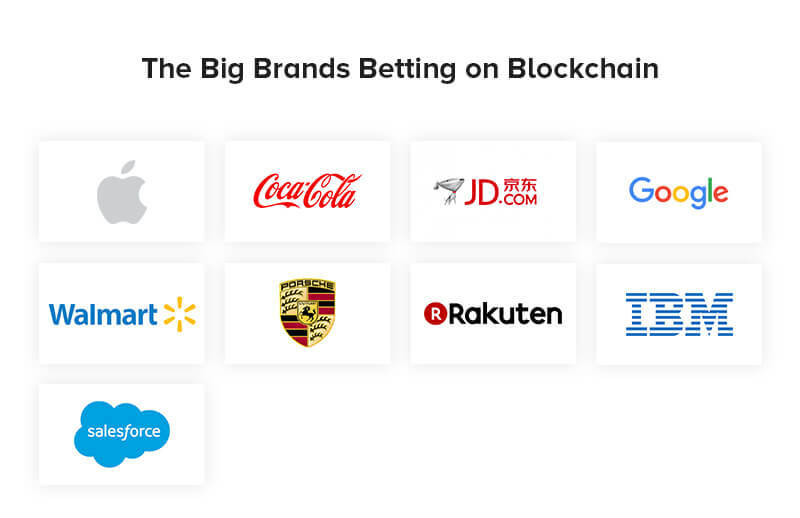 In Blockchain Use Cases Beyond Bitcoin, this is the section where we look at the brands that have decided to get involved with Blockchain. The tech giant is known to be the biggest investor and buyer of the startups working in Blockchain technology. The Alphabet Inc section of Google is building its distributed digital ledger which third parties can make use of posting and verifying transactions. Google plans on offering this service for differentiating its cloud service from the competitors. Apple filed a provisional patent in December which stated that the tech leader would be designing a Blockchain system for creation and verification of timestamps, which would help in fighting the hackers and certifying the digital signatures. The leading automobile maker has already introduced Blockchain in its cars. 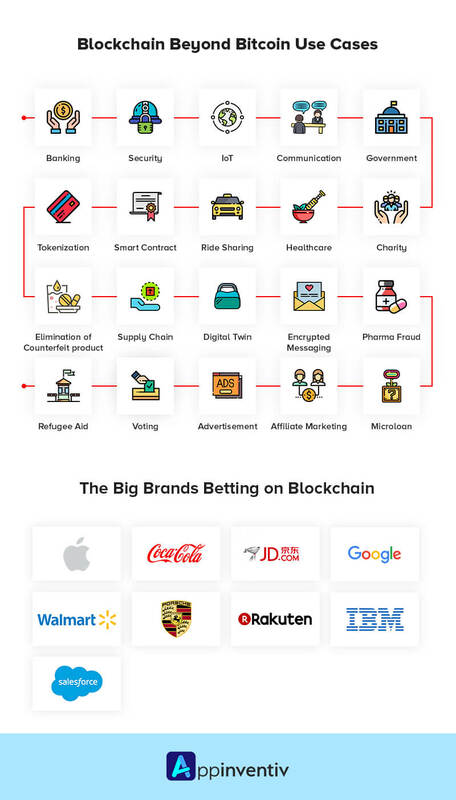 There are a number of benefits that the brand accepted going blockchain brought for it. The beverage leader, along with the US State Department is developing a Blockchain ledger which is designed to remove the state of forced labor from across the globe. Using the technology, they will develop a secure registry for the workers which would help with fighting forced labor market, globally. The company recently revealed its chip which they called the world’s smallest computer, that would help brands use Blockchain in verification of authenticity of the products in a supply chain. IBM also uses Blockchain to deliver distributed ledger services to over 400 different clients around the world including government, banking, logistics, and healthcare. Alibaba competitor recently published a white paper where it described its Blockchain ambitions. The brand shared its plan to build Blockchain protocols for authenticating goods to a better supply chain, protect big data, settle finance, and battle insurance fraud. Wish to join the growth tangent that Blockchain technology takes industries on? Know how much Blockchain App Development would cost you. “Enterprise Blockchain: The Monumental Shift From When to Why is Here,�?